Our Chocolate cordial cups are just waiting for you to fill them with liquar or your favorit mousse.Enjoy a nice fruit compo deep within this delectable treat. Manufactured from our creamy white chocolate. 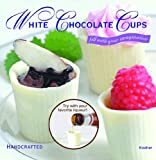 measures about an inch tall and an inch diameter at the top.Let your inner chef loose and see what you can make for dessert tonight. Licensed Kosher-dairy and Certified Halal.